Since the cost of living in California is quite high as compared to other U.S. states, the average salary of CNAs for nurse aide job postings in the state is 7% higher than the national average. As per the data provided by the Bureau of Labor Statistics, the mean annual and hourly income of these professionals (in May 2013) was $29,910 and $14.38, respectively. The state employed 97,420 certified nursing assistants and employment per 1,000 jobs was 6.62. According to indeed.com, the average CNA salary in California, in December 2014, was reported to be $26,000. CA ranks among the top five states that have the highest employment level in this profession. The salary of certified nurse assistants depends upon the percentile bracket, under which they are categorized. 90% of CNAs made less than $42,440; 10% made more than $42,440. 75% of certified nurse assistants earned less than $34,490; the remaining 25% earned more than $34,490. 50% of the employees were salaried at less than $28,210; the rest of 50% were salaried at more than $28,210. 25% of CNAs were paid less than $23,770; 75% were paid more than $23,770. 10% of employees were compensated less than $20,750 per annum; 90% were compensated more than $20,750 per annum. CNAs working in California earn a lucrative income in most of the cities of the state. 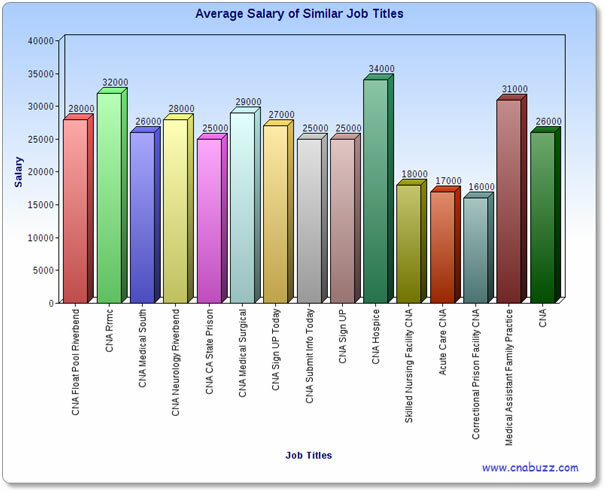 There is a little variation in the salary figures among the different cities. As per the reports of salary.com, the cities in CA that provided the maximum median annual salary (i.e. $37,485) were Daly City, Richmond and San Francisco. The median hourly salary provided by these cities was $18. The median monthly salary in CA fluctuated from $2,565 to $3,124. The median hourly wages were between $15 and $17. The income of CNAs is affected by the position they hold. This occupation has a number of job titles, among which the highest paid professionals in December 2014 were CNA Hospice ($34,000) and CNA Rrmc ($32,000), as per indeed.com. The earnings of other job titles varied from $16,000 to $31,000. Apart from lucrative salary, all CNAs are provided with some additional benefits that are necessary for their advancement. Some of these benefits are listed below. Since CA is a large state, the population of senior citizens in the state is also high, and to take care of them, huge numbers of CNAs are required. Potential certified nurse aides can anticipate numerous job openings in residential care facilities, rehabilitation centers, hospitals, assisted living facilities, etc. The Bureau of Labor Statistics has projected an overall 21% rise in the demand of nursing assistants, between 2012 and 2022. There are chances of better job security if you work in specialty fields, like emergency medicine or geriatrics. Question 1 – Can you tell me the best paid nursing assistant jobs in California? Answer – The best paying nursing assistant jobs in CA in December 2014 (according to indeed.com) were CNA Hospice (with an annual income $34K), CNA Rrmc and Medical Assistant Family Practice ($31K per annum), and CNA Medical Surgical ($29K per year). Question 2 – Since the cost of living in CA is high, how much average salary can I expect in the state? Answer – CNAs can expect an average annual salary of $26K (according to indeed.com, as of December 2014).